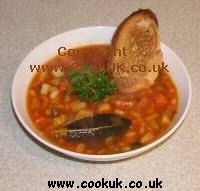 Any decent winter vegetable soup recipe should produce a thick soup and this is why pearl barley is used. NOTE! Picture shows 4 parsnips but the recipe is correct, only use 1 parsnip. We got carried away and used the other 3 parsnips for a different recipe. Pearl Barley is a 'pulse' well known to cooks but if you are an amateur, I can assure you your local shops will stock it. It's normally near the dried vegetables (such as lentils). It is also cheap and keeps for ages and ages! If you keep to the cooking times below you will end up with a soup where the vegetables still have a bit of their 'crunch' left, just the way we like it. Cooking for longer will soften the vegetables more. 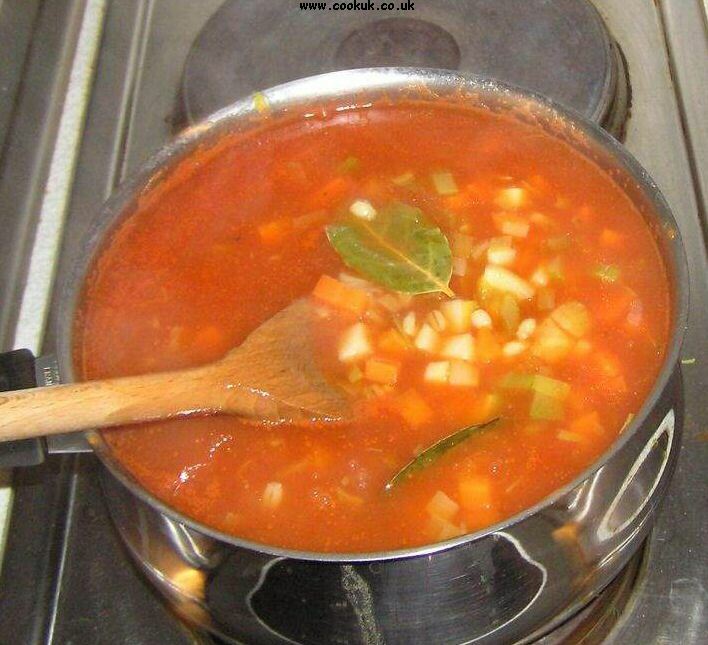 No salt has been included in the recipe because the stock cubes / tinned stock will contain enough salt on their own. Taste the soup five minutes before serving and add any more salt at that point if you want. First, make the chicken (or vegetable) stock either using stock cubes (follow packet instructions for how many cubes to make 2.5 pints) or canned chicken / vegetable stock. Use a medium sized-pan. Add the pearl barley and simmer the mixture whilst continuing on with the steps below. Stir occasionally. 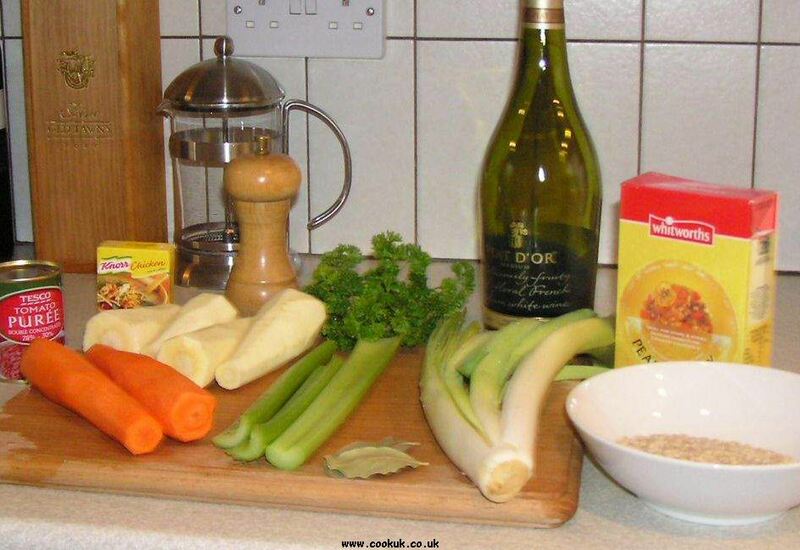 Chop up the carrots, leek, parsnip and celery into small cubes. 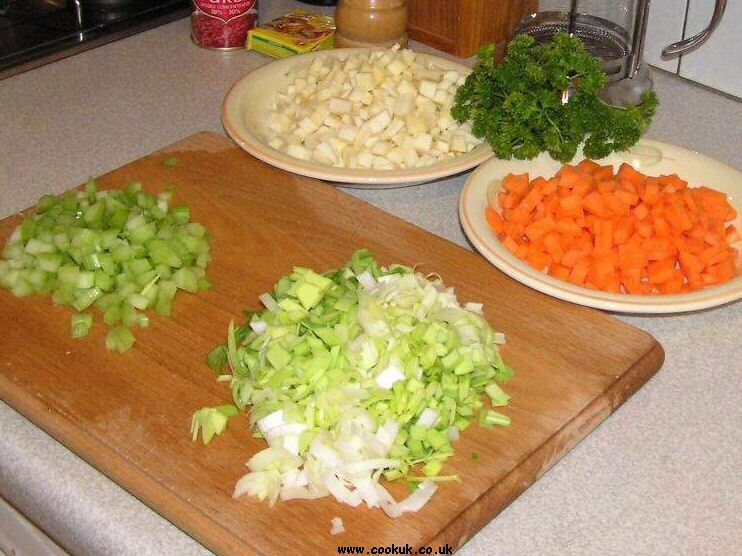 Click on the picture to the right to give you a better idea of the best size to chop the vegetables. Add wine to another (large) pan and then add the leeks. Simmer this mixture for about five minutes with the pan covered. Stir a couple of times to prevent the leeks sticking to the bottom of the pan. 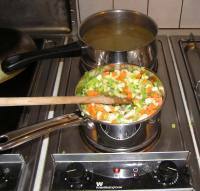 Add the remaining chopped vegetables to the large pan. Simmer for another 5 minutes stirring a couple of times. 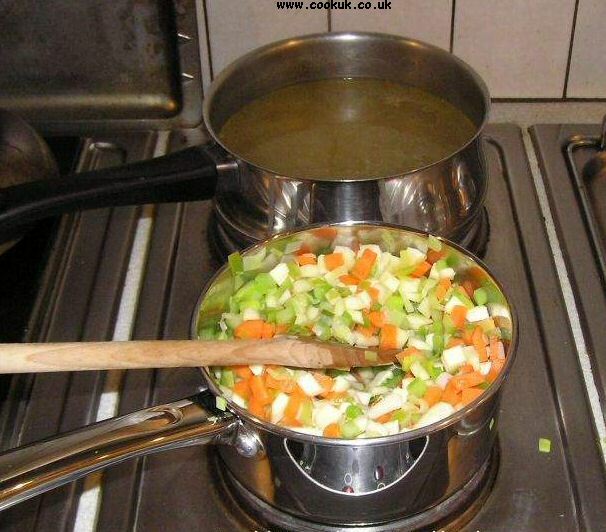 Pour the stock / pearl barley from the medium pan into the cooking vegetables in the large pan. 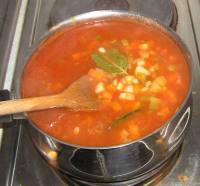 Add the tomato puree and bay leaves to complete the soup. Bring it to the boil then simmer for about 25 minutes stirring occasionally. Just before serving the soup, toast some bread. Immediately before serving season the soup with the ground black pepper and chopped parsley. 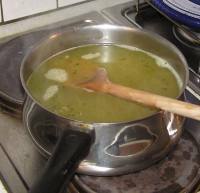 Serve the soup into four large bowls. Sit back and enjoy! 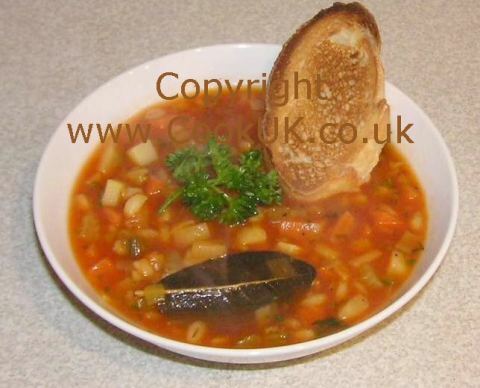 This soup tasted delicious, easy to make and enjoyed by all the family! Umm just made this Winter vegetable Soup but with a couple of very minor alterations... Halfway through sweating the leeks I added three chopped cloves of garlic and when adding the rest of the veg added 140g tin of sweet corn and 125g tin of butter beans. Once cooked I blitzed it with a handheld blender... absolutely fantastic... worth £10 a bowl in any restaurant. TRY IT! Absolutely lovely. Easy to prepare and even easier to eat!!! 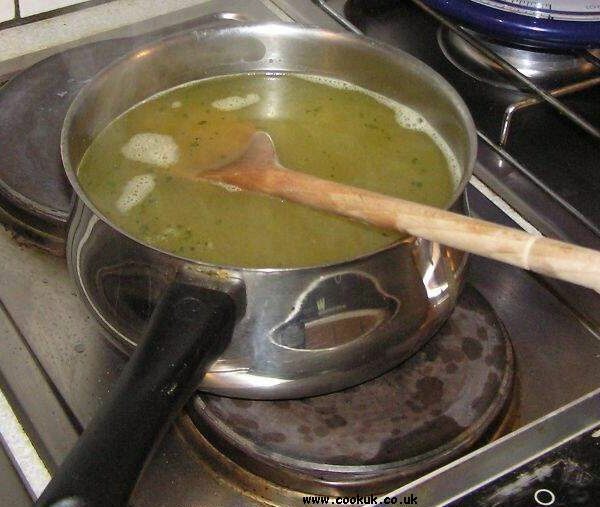 Lovely soup, the whole family loved it, Julie. Brilliant! my kids love it! I loved the flavour but found the amount of pearl barley a bit overwhelming. Can potato be used instead, or as well as some pearl barley?? 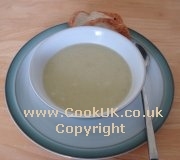 Answer: Yes, chop the potatoes into smallish cubes and add to the soup about 25 minutes before it has finished cooking. You will need to experiment with exactly how much potato to add instead of pearl barley, but both absorb liquid. Fantastic instructions for a basic vegetable soup - and I mean absolutely nothing derogatory when i use the term 'basic'. I followed markie marcus' principle and added butter beans and blitzed it but with potatoes for body instead of sweet corn. My wife is ill at the mo, but won't eat a chunky soup and she loved this. Thanks for the recipe. So easy and very tasty. Did as others have done and added chilli and garlic. Now I have the basics will definitely try other veg with it maybe replace the leek with red onion for extra colour or swede instead of parsnip. 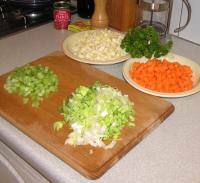 I use this soup as a base to add different vegetables to vary the taste. Great taste indeed. Love this recipe, so simple and tasty. A meal in itself! Thank you. Really delicious soup, the family loved it. I added a bit of sweet potato, onions and garlic. Took out half the veg and hand-blended the rest. Added the veg back in and it made a thick and chunky soup. Perfect. 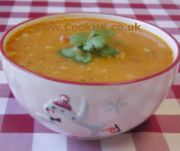 What a fantastic soup, I made enough for me to freeze asked the daughter and grandaughters to try it, all ages loved it, am about to make three batches one for each daughter and one for myself and husband.